While the words, "Easter egg hunt" might conjure images of tiny tykes frolicking through the local park -- gleefully gathering plastic candy-filled eggs in brightly colored baskets -- teens can get in on the fun too. Just because you have a teen, and not a toddler, doesn't mean that you can't stage an awesomely imaginative Easter egg hunt that even your "big kid" will enjoy. Instead of the traditional hide and seek Easter egg hunt model, try a more complex activity that your teen will enjoy. Invite enough of your teen's friends over to make at least two teams of four or five kids each. Create clues to guide the kids around your house, through your yard or around town, looking for eggs. For example, hide an egg under a local historical statue, giving the players a fact-based clue. Another option is to give the teen teams clue coordinates or an address to enter into a cell phone GPS. Whichever team hunts out the most eggs wins a special surprise such as a basket of Easter candy to share. 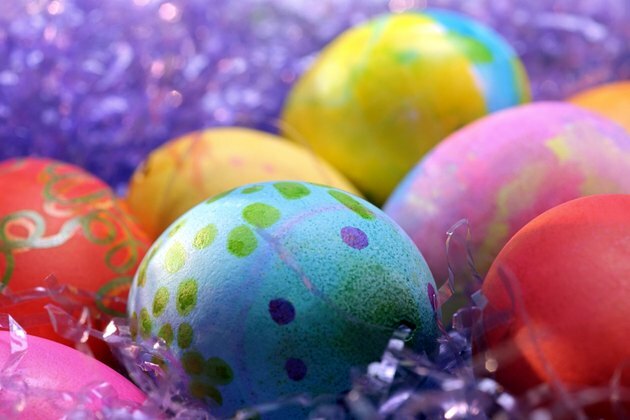 Instead of hiding the eggs in a small section of your yard or home, place them around the neighborhood -- avoiding any private property that you don't have permission to use -- and draw a map to find them candy-colored gems. Give each teen his own map, marked with the locations of the eggs and set a clock for one hour. Your teen is old to enough to read a real map. Print out copies of a community map that can test the guests locating skills. Like the scavenger hunt, you can also allow a cell phone GPS app to help the kids locate the eggs. Count how many eggs each teen has found when the hunt wraps up. Hand out prizes, such as an over-sized chocolate rabbit or a box of marshmallow chicks, for first, second and third places. Set up an egg-gathering relay that tests your teen's -- and her friends' -- physical abilities. Toss a few dozen plastic eggs into a grassy area, hiding them among shrubs or plants. Divide the teens into two teams, placing them on the opposite side of the yard from the egg area. Give the first player on each team a basket, yell, "Go" and have the kids race down to the egg area to hunt for and collect their bounty. After each player fills her basket to the top with eggs, she can race back to the other kids and hand off her eggs. The next player runs back to the egg area and dumps out the basket for the following racer. Continue this alternating pattern until each teen has a turn. Whichever teen goes through all of his players first is the winner. If your teen is more of a night owl than an early morning bunny, stage an "in the dark" egg hunt. Turn off any outdoor lighting such as a porch or deck light, making your yarn completely dark. The kids can use their own flashlights to find the hidden eggs in your backyard or spread out glow in the dark versions. If the weather won't cooperate, try an indoor version. Coat plastic eggs with black-light paint. Kids the eggs in one room. Invite the kids in while the lights are still on. Switch off the main light, turn on a black light and have the kids hunt for the glowing eggs.